Whether you want a spa special that puts you on a white sandy beach in the tropics, in the Tuscan countryside, or in the desert, read on for some unique ideas. Most of the packages are priced for two guests, so text your best friend or book a romantic trip and bring your partner along. Relax, rejuvenate and reconnect with your girlfriend with one of these offers which include treatments, healthy meals and fitness classes. Reconnect in the Wine Country: Girls' Getaway at Solage Calistoga lets you reconnect with your best friends. It includes: 2 nights in a studio, cocktails, access to geo-thermal pools, spa treatment, breakfast and wine tasting. 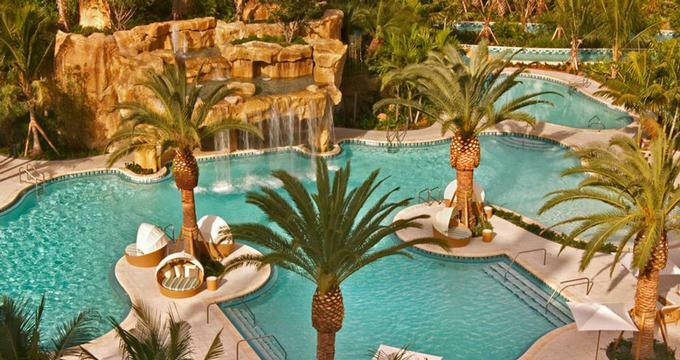 Luxury Trip to Florida: The "Pampered Pals Getaway" at The Sandpearl Resort includes: two nights, Welcome Gift, $100 dining credit, (1) 50 minute massage therapy treatment for each, and Breakfast for two each morning. Get away to Italy: If you have time for a longer stay, take a look at the Wellbeing Ritual at La Posta Vecchia. The offer starts from 529 Euro per person and includes: Two nights in a Superior Deluxe room and buffet breakfast, Welcome basket of fruit, Treatment with natural herbal teas before the experience, A Sensorial class to learn the art of natural cosmetics and the secrets of wellbeing for your body, 90-minute Body Ritual of your choice, 15% reduction on facial and body treatments, Room upgrade upon arrival, subject to availability and a Guided tour of the onsite II century B.C. Roman museum and villa. Relaxation on Florida's Northeast Coast from $145: Treat yourself to a relaxing spa trip at the Hammock Beach Resort on Florida's Northeast Coast with one of these great offers. The Perfectly Paired Romance special starts at $145 per person, per night and based on a 2-night minimum/maximum stay and includes: champagne, fruit, breakfast and a 50-minute couples' massage. If you are getting away with your girlfriends, take a look at the Ladies Putt and Pamper offer which includes: champagne, spa lunch, Hot Stone Massage, Golf with cart included. The resort also offers a nice selection of day wellness specials which you can add on to your stay. "Relaxation as Far as the Eye Can Sea" includes a relaxing wrap, facial, massage and a pedicure. The "Spa Sampler" includes a facial, Back, Neck & Shoulder Massage and Pedicure. Napa Valley Deal for Couples: Consistently rated one of the best places to stay in Napa, Solage Calistoga offers several signature treatments that you can all on when you check in. Or you can visit the wellness center on a day trip from a West Coast city, the choice if yours. If you are traveling with your better half, try the "Mudslides For Two" (the deal is priced at $180, but it's actually a $246 value). You will receive a signature three-part Mudslide treatment for two at the Bathhouse, and a soak in the hotel's geo-thermal mineral pools. Santa Monica from $195 per Person: Relax and rejuvenate with the Sea Pampering package at Casa Del Mar in Santa Monica. The specials includes a 60 minute Swedish or deep tissue massage and a 25 minute facial. Complimentary parking is included too. Offered Monday - Thursday. Rates from $195 per person (a $340 value). Elixir of Beauty in Campania: Get away for a few days of rejuvenation surrounded by the scenic Italian countryside at Aquapetra resort in Campania, Italy. The "Elixir of Beauty" special includes: 2 nights for two (Superior or Deluxe room), A welcome drink in Il Portico bar, A buffet breakfast featuring organic produce and freshly baked cakes and croissant, A light lunch set next to the outdoor pool; Aqua Spa therapy path: internal whirlpool, sauna, steam room, kneipp therapy facilities, aroma/cromo therapy shower; A back and neck massage with essential oils for two; Dinner with a choice of three courses in La Locanda del Borgo. The property frequently offers seasonal and holiday specials. The Spring Special Offer includes: 1 night accommodations for two guests, buffet breakfast, Minibar complimentary soft drink, Access to the Aqua SPA, Free access to the fitness area and a romantic 3-course dinner. 3 Nights in Amalfi: The Amalfi Coast is famous for its spectacular views, great spas, gourmet Italian cuisine and romantic ambiance. Get away with one of these deals. Hotel Santa Caterina is offering a special which includes: 3 nights, breakfast buffet, 1 lunch (per stay), champagne, fruit basket, flowers, 1 massage per person, free parking and free access to the gym. From 399 Euro per night. 1 Day Wellness Offer: If you are touring Italy on your trip, take a day to relax and rejuvenate in Amalfi with this Wellness Package at Hotel Rialto. It includes: Accommodation in a double room; buffet breakfast ; 1 free entrance SPA per person (indoor swimming pool, sauna, turkis bath, emotional showers, relax area); 1 body massage per person; 1 face treatment per person; 1 fruit cocktail per person; discount 20% on Decleor products and on Kent's make-up. 300 Euro Credit: Hotel Caruso Belvedere is offering: Luxury accommodation, Daily buffet breakfast, €300 spa credit per room, per stay, Welcome amenities and Two meals at the hotel's restaurants (lunch or dinner). Wellness Experience in Sydney from AUD $435: Plan a romantic getaway to Sydney, Australia and check into the stylish Langham, Sydney. The hotel is offering a number of great luxury specials to choose from. The luxury "Spa Experience" includes: Overnight accommodation for two persons, Daily full Australian breakfast for two in Galileo Restaurant, One treatment up to the value of AUD $100 (or gift voucher to the same value), A turndown gift, Access to wellness facilities, and Daily newspaper. From AUD $435 per night. "Happily Ever After" is a unique special which includes breakfast, chocolate dipped strawberries, late check out, free access to the health club and pool. Rejuvenate in Miami, Florida from $329: If you are planning a trip to Miami, Florida, take a look at these great spa offers which will make you feel pampered from head to toe. The "Ultimate Spa" special at the Turnberry Isle resort in Miami includes: two daily spa treatments, breakfast, valet parking for your car, 20% off additional treatments. Rates start at $329 per night. The "Spa Escape" at Doral includes breakfast, spa treatments, and fitness center access. Rates start at $214, depending on the season. You may also like the "Escape Your Way Golf or Spa Package for Two" at Doral which includes: golf or a massage, one complimentary upgrade on the Great White Course per stay (on certain dates), breakfast, free access to the wellness center. Rates start at $209 per night. Relaxation and Rejuvenation in West Virginia: Get away for a weekend of relaxation and rejuvenation at The Greenbrier Resort with "The Greenbrier Simply Spa Package" which includes: Luxurious accommodations for two nights, and a $500 Spa Credit per person ($250 per night) to be used toward spa services. The spa package starts at $330 per person, per night midweek and from $350 per person, per night on weekends. This is a great destination for golfers. Ask about the "Unlimited Golf Package" which starts at $175 (double occupancy) and includes: Unlimited golf (Old White TPC and Oakhurst Links cost extra), no cart fees for replay rounds. The "Create Your Own" Spa Package gives travelers plenty of flexibility to pick the treatments they want. Guests receive more savings for more treatments they book, up to 30% off. Rainforest Retreat in Saint Lucia: Sugar Beach, a Viceroy Resort is surrounded by a lush rainforest and a beautiful sandy beach. Enjoy every fifth night free with breakfast for two daily. Spend the money you save at the beautiful Rainforest retreat. Ask for the "Linger Longer - Get the 5th Night Free" package: stay five or more nights and receive a complimentary night and full breakfast daily. Stay five receive one free night and stay ten receive two free nights. Offered from May through October. Southern Caribbean: Spa Splendor in Curacao offers a 3-night package that includes accommodations and the following perks. The package is priced from $1,220 for three nights for two guests. Get pampered with half a day of Services including a 50 minute hour Relaxing Massage, 60 minute Foot Reflexology, and choice of 45 minute Mini Facial or Gentleman's Total Care Facial. Guests also get to use the fitness center, Sauna, Steam Room and Jacuzzi. The sister property, the Sandton Kura Hulanda Lodge & Beach Club has an on-site dive shop and a beautiful beach. Resort in Arizona: Arizona Biltmore is known for its architecture and desert scenery. Ask for the Wright Combination package (from $700) which includes a 6-hour pampering extravaganza: a Dream Catcher Aromatherapy Massage (80 minutes), Biltmore Custom Facial, Desert Heat Therapy Wrap and a Caviar Manicure and Pedicure. Customized Wine Country Retreat: Travelers at Hotel Healdsburg in California's wine country receive a customized experience that includes two 50-minute spa treatments, 15 % off all additional treatments, breakfast and complimentary valet parking. The package is available Sunday through Thursday, from $540. The hotel also offers a food package (from $898) which includes: two nights in a Premium King or Double Queen room with six foot soaking tub, six-course dinner, two 50-minute spa treatments, breakfast and valet parking for your car. Three Signature Packages in the British Virgin Islands: Just arriving in the Caribbean is a relaxing experience, but once you check into the elegant Grace Bay Club you'll feel that your dream vacation is becoming a reality. Grace Bay Club in the BVI gives you a choice of three packages as an add-on to your room rate. The 4-hour Caribbean Delight ($460) includes a Anani custom Massage, Pro-Collagen Marine Facial, Exotic Hand Ritual and Sole Delight. The 3-hour Exotic Indulgence ($370) includes a Half Lime and Ginger Salt Glow, Aroma Detox Wrap, and Reflexology. And if you are planning a Caribbean beach wedding, the 3-hour Radiant Bride signature treatment ($300) will let you relax and glow with anticipation with the Hand Ritual, Sole Delight, Coconut Rub and Milk Wrap with pre-make-up Facial. Luxury near San Francisco: Plan a short trip from San Francisco and rejuvenate in a country setting. This package at the Auberge Spa includes breakfast, massage for two and a wine amenity. Ask for the Relaxation & Rejuvenation package which is available any night of the week (minimum night stay restrictions apply over holiday periods). Rates start at $1,138. For longer stays, take a look at the "Taste of Napa" package which includes: a three-night stay, dinner, wine, lunch, breakfast each morning, balloon ride, winery tour with a private car, and a massage for two. This 3-night package costs from $4,046 per couple. Detox, Weightloss and Pampering in Tuscany: When you check into Castel Monastero in Italy, there are many programs you can choose from that can dramatically improve your life, ranging from weight loss and revitalizing therapies which help you sleep better to detox and gourmet diet. The wellness center offers a number or relaxing treatments, customized to each guest. The Indulgence package (from Euro 620) requires a 3-night minimum stay and includes breakfast, welcome amenity, 2 body treatments (75 min each), one facial treatment per person, access to the indoor water area of the spa with a sauna, Turkish bath, 2 indoor pools, chromo and aroma therapy showers. Carmel Valley with Your Best Friend: Sometimes it's time to reconnect with your best friend in a luxurious setting. Bernardus Lodge in Carmel Valley designed a package with just such a noble goal in mind. For $249, best friends receive a 25-min Chardonnay Body Polish followed by a 50-minute Chardonnay Facial, lunch by the pool, a La Bella Donna make up refresher, and complimentary wine tasting at Bernardus' tasting room. Valid Sunday through Thursday for up to six people. Rooms are additional, or you can plan a day trip with your friend. 2-night Southern California Trip for Couples: Miramonte Resort near Palm Springs has a package for couples that combines a romantic dinner at its restaurant with pampering at the spa. There is a two-night minimum, so be ready to relax on this getaway. Ask for "Romance in the Desert" which includes two nights in a luxury room, one dinner for two at The Grove, per stay, two 60-minute treatments (massage, facial or scrub), champagne and chocolate-covered fruit, Guaranteed late check-out at 2pm and Rose petal turndown. The Ultimate Retreat in Bali: Uma Ubud in Bali is home to one of the top wellness centers in the world. Choose from two-, three-, or four-night stays with accommodation of your choice. This is an all-inclusive getaway with all meals included, complimentary yoga classes and guided walks. The Uma Ubud packages also include a 60-minute massage and a choice of different treatments. The Spa at the Woodstock Inn & Resort encourages tranquility to flow throughout its LEED-certified calming treatment rooms and unique architecture. Indulge in a spa therapy that will remove all traces of tension, then plunge into the outdoor pool, or relax in the warmth of the Shaker wood stoves or soak in the healing waters of a hot tub. Embrace the nature inspired tranquility of Vermont’s picturesque surrounding and unwind beside the warmth of the outdoor fire. The Woodstock Spa Package includes accommodations, a $100 Spa Credit per room, per night, and a Vermont breakfast for two.